This month, we had the pleasure of doing a Skype interview with the utterly delightful Myra McEntire about her debut novel, Hourglass, which is published by Egmont and out in stores today. It's a fantastic, fast-paced book about time travel and romance that kept us both completely captivated. So tune in to the June episode of Authors are ROCKSTARS! for our book picks of the month- Hereafter, by Tara Hudson, and Beauty Queens, by Libba Bray- and enjoy Myra McEntire's thoughts on speaking Southern, the necessity of hoodies and fuzzy socks for successful writing, and choosing the right literary agent. Hosting courtesy of archive.org. Music at the top provided by 46bliss. The featured song of the month is "One More Day," by Amy Ayres. Thank you for listening! Please drop us a comment and let us know what you think. Cool!<3 I love your podcasts! And Myra seems such a nice person! Wish I was there to chat with you all! :) I learned a lot about Myra and her book, now I'm dying to read it! P.S. Love the song of the month! Thanks for the kind comment, Deea! We so appreciate you listening. 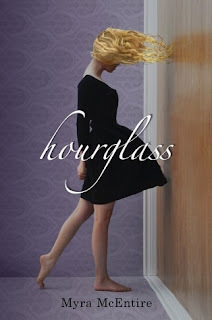 Hope you've had a chance to check out HOURGLASS-- such a great, addictive read for the summer!